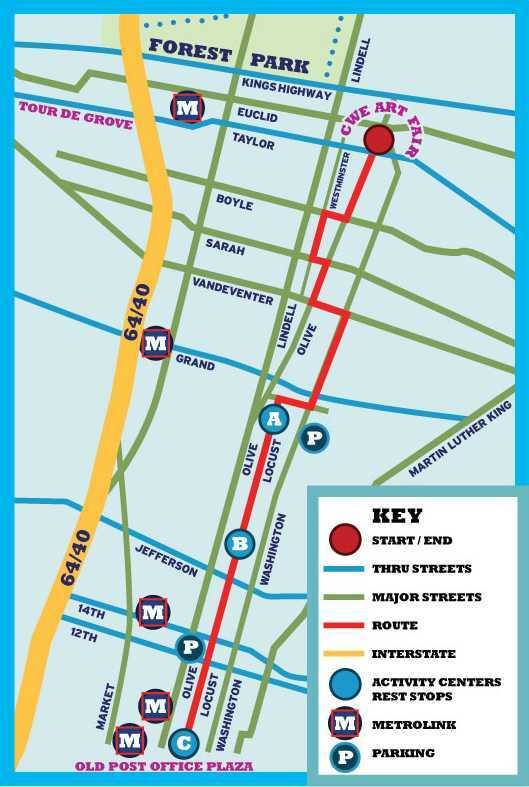 St. Louis will be all about bikes this weekend with the return of St. Louis City Open Streets, the Tour de Grove cycling and neighborhood events, and ARTCRANK, a show featuring bike-inspired posters by local artists. Throw in the Central West End Taste & Art Fair, accessible by bike and transit, and you’ve got a full weekend of great St. Louis events. Open Streets on Sunday, June 13 from 8am -1pm is a chance for you to walk, bike, run, skate, push a stroller, hula-hoop, pretty much whatever you want on a street route closed off to automobile traffic. It’s a great opportunity to explore St. Louis neighborhoods, be active, meet local business owners, and get out with friends and family. At the last Open Streets event in June, I saw badminton games, picnics and lemonade stands, as well as food and beverages available along the route. In addition, hubs located along the length of the route host a variety of activities – strength training, hula-hooping, yoga, kids contests, mini massages, stretching instructions, cooking demonstations and more. The route will link the Old Post Office Plaza in Downtown St. Louis with the Central West End Taste and Art Fair on Euclid Avenue. The CWE Taste and Art Fair is Friday through Sunday featuring over 60 regional artists, 19 local eateries and live music on Friday and Saturday. The Fair location is only a few blocks from the Central West End MetroLink and Bus Transfer Center. Trailnet in partnership with Great Rivers Greenway and the City of St. Louis will also host a Bike St. Louis tour for experienced cyclists starting at Anheuser-Busch and complete with a stop at the Velodrome in Penrose Park. 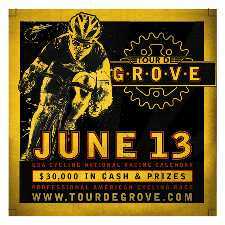 Also this weekend, the Forest Park Southeast neighborhood will host the 2010 Tour de Grove events Saturday and Sunday, with multiple cycling races and a 5K race, live music and VIP spectating parties. ARTCRANK, featuring bike-inspired posters by 35 local artists – all just $30 each – at Atomic Cowboy in the Grove on Saturday, June 12 (7:00 – Midnight) and Sunday, June 13 (Noon – 4:00). To get to all of these amazing active events this weekend, you can take bicycles on MetroLink trains in the rear of the first car, and both front and rear of the second car. Also, all MetroBuses also have racks for two bikes on the front of the bus. Plan your trip on Google Transit. Few excuses and plenty of reasons to get out and support our local biking and pedestrian, art, dining and music scene in St. Louis this weekend. And every weekend for that matter!